Birth Date: April 16, 2016 PMY 1347D S A V 004 Predominant 4438 Peak Dot Predominant 351W Rose Of Peak Dot 864L H70 Quantock 1207W H70 Quantock 1207 Ms 1210Z H70 Quantock 1 Ms 1056T calving traits	maternal traits	growth traits	Fertility aod	ce	bw	adj 205 Dw	Milk/epd	ww/EPD	yw/epd	ADJ 365/Dw	S.S. 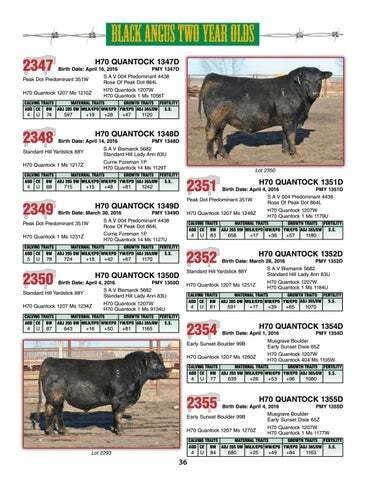 Birth Date: April 14, 2016 PMY 1348D S A V Bismarck 5682 Standard Hill Yardstick 88Y Standard Hill Lady Ann 83U Currie Foreman 1P H70 Quantock 1 Ms 1217Z H70 Quantock 14 Ms 1129T calving traits	maternal traits	growth traits	Fertility aod	ce	bw	adj 205 Dw	Milk/epd	ww/EPD	yw/epd	ADJ 365/Dw	S.S. Birth Date: April 1, 2016 PMY 1354D Musgrave Boulder Early Sunset Boulder 99B Early Sunset Dixie 65Z H70 Quantock 1207W H70 Quantock 1207 Ms 1260Z H70 Quantock 404 Ms 1105W calving traits	maternal traits	growth traits	Fertility aod	ce	bw	adj 205 Dw	Milk/epd	ww/EPD	yw/epd	ADJ 365/Dw	S.S. Birth Date: April 4, 2016 PMY 1355D Musgrave Boulder Early Sunset Boulder 99B Early Sunset Dixie 65Z H70 Quantock 1207W H70 Quantock 1207 Ms 1270Z H70 Quantock 1 Ms 1177W calving traits	maternal traits	growth traits	Fertility aod	ce	bw	adj 205 Dw	Milk/epd	ww/EPD	yw/epd	ADJ 365/Dw	S.S.